A contemporary mix of Korean and Japanese cuisine, featuring the best seasonal ingredients that are designed to encourage sampling and sharing at the table. Located in the heart of Old Town on Main Street in Park City, UT, Yuki Yama offers the freshest seasonal fish flown in from both the East and West Coast. 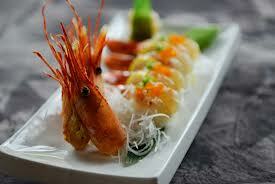 Yuki Yama’s menu consists of traditional Japanese sushi, sashimi, maki and noodle dishes. A contemporary mix of Korean and Japanese cuisine, featuring the best seasonal ingredients that are designed to encourage sampling and sharing at the table. The blend of wood, light and stone décor offers a festive ambience and unique dining atmosphere. Seating is available at the sushi bar, in the main dining room or in our popular tatami room. The restaurant's signature element is a 40 x 12 ft. stone slate wall.